The Summer Palace or the Garden of Clear Ripples was established in 1750 by the Qing Emperor as a luxurious royal garden for the royal family to relax in and have a peaceful time. However it underwent many changes throughout the years. Certain parts of the palace and the garden were demolished and in the 1880’s it was reconstructed under the rule of Emperor Guangxu. In 1900 the place was destroyed again by the international expeditionary force. In 1924 the garden was recreated and gifted to the society as a public park. Summer Palace in Beijing spans across 2.97km2 and a considerable amount of land in the garden is covered by crystal clear water. 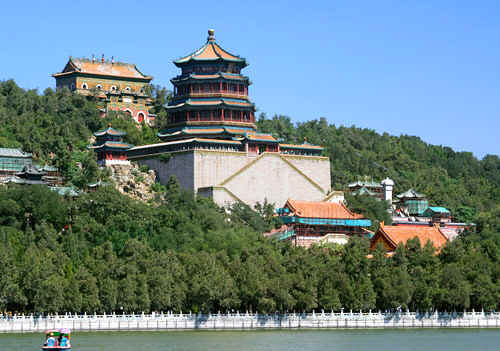 The two main features of this royal garden are the Hill of Longevity and Kunming Lake. The garden is separated into three parts, each with its specific purpose. The political area of the garden is accessed through the East Palace Gate and the Hill of Longevity and the Benevolence are the highlights of the area. The residence area is created incorporating three complexes of buildings which are named as the Hall of Happiness, the Hall of Jade Ripples and the Hall of Yiyun. Most of the palace area is dedicated to recreation and sightseeing. The peaceful surroundings of the northern side of the Longevity Hill and the gently flowing stream offer the tranquillity and serene atmosphere that is needed to relax and loosen up. Situated fifteen kilometres away from central Beijing, the Summer Palace is a top tourist attraction in China and it also serves as a popular recreational ground in the city. There are numerous locations within this garden to explore and walk around and the travellers to Beijing should not miss a chance to pay a visit to this breathtaking imperial park. For anyone who is in search of a luxury apartment in Beijing, the centrally located Somerset Grand Fortune Garden promises convenient accommodation accompanied by a well- appointed series of serviced apartments. Beijing boasts of many historical sites, temples and gardens, but Summer Palace definitely tops the list as a marvellous garden to spend a peaceful day out enjoying the scenic and serene setting of this picturesque site.